Hi, I’m Jon Brothwell, the Optometrist and owner of Pybus Opticians in Canterbury. I took over here at Pybus Opticians back in March 2013 (just 3 months before my first baby was born! ), when the previous owners, Pauline & Arthur Pybus, retired. I come from a family of Opticians, with my grandfather, mother, auntie and cousin all in the profession. I have been qualified as an Optometrist for nearly 15 years and have worked in various opticians (including chain, independent practices and even here at Pybus) throughout that time, but owning my own independent opticians has always been my dream. I am a member of the Kent & Medway Local Optical Committee (LOC), which represents all Contractors and Optometrists providing General Opthalmic services in this area. I have a professional and personal interest in sports vision and can often be found fishing off the beach in Deal, mountain biking, clay-pigeon shooting or watching motor sports. My wife, Sarah, also works here, ensuring the smooth running of the business and also marketing the practice, in between running round after our two children (and me!) that is. 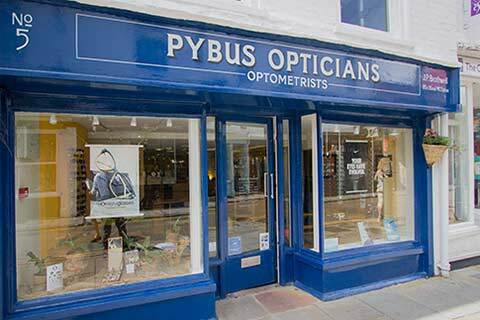 Pybus is a family run and family friendly independent opticians, located in the heart of Canterbury’s Kings Mile. There has been an opticians in this building for over 30 years and we continue to provide excellent eye care for you and your family, throughout the eye examination and during the dispensing of your glasses. Mel Harwood is our Dispensing Optician (DO), and has been with Pybus Opticians since 2007 and it was during this time that she gained her DO qualification. Mel has a particular interest in low vision, including cataracts, macular conditions and advanced glaucoma. Sarah Praman is our Dispensing Assistant celebrated her 25th year at the opticians in 2016 and she still continues to provide patients with the same level as enthusiasm as the day she started! Sarah has a fantastic ability to spot frames that will suit the customer perfectly, taking into account all kinds of information such as face shape, colouring, taste in clothes and jewellery. She has the knack of choosing the right frame every time! Come along and see us at Pybus Opticians, No. 5 Palace Street, Canterbury. Over 4,000 people in the Canterbury area trust us to look after their eye care – why don’t you? Did you like this article? Then share it with your friends!